LATEST UPDATE: MMFF 2013 Top 3 films on 1st Day, are 'My Little Bossings', 'Girl Boy Bakla Tomboy' and 'Pagpag'. Mostly sold-out screenings for these 3 entries. In 4th is 'Kimmy Dora: Ang Kiyemeng Prequel'. Congrats! PREVIOUS UPDATE: It's Christmas, December 25! It's MMFF time! Today is the opening day of the 39th Metro Manila Film Festival (MMFF 2013). Malls open earlier than usual, their cinemas are showing only Pinoy films. 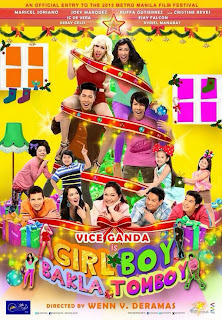 Of the 8 MMFF 2013 official entries, I think the top grosser will be 'Girl Boy Bakla Tomboy', the movie which stars Vice Ganda and is directed by Wenn Deramas, both from last year's festival topgrosser 'Sisterakas'. Even without Kris Aquino and Ai-Ai delas Alas Alas who starred with him in 'Sisterakas', Vice Ganda is out to prove he can carry the movie to the top of MMFF 2013 box office chart. If Youtube views of its trailer is an indication of its box office potential, 'Girl, Boy, Bakla, Tomboy' will be a runaway winner as its trailer is the only one with over 1 million Youtube views (1.5M) among the 8 entries. Meanwhile, Ai-Ai has no entry this year and is just helping promote Kris' movie with Vic Sotto, her son James 'Bimby' Yap and child wonder Ryzza Mae Dizon entitled 'My Little Bossings', another comedy film which is also expected to do well. I think it will be the 2nd top grosser at first, since most theaters have picked it and Vice's movie as their Top 2 choices, but 'Pagpag: Siyam na Buhay', the only horror film in the festival starring the hottest teen loveteam Kathryn Bernardo and Daniel Padilla could end up in that position. Just like what happened last year, 'One More Try' was only 3rd at the start of the festival, but it managed to overtake 'Si Agimat, si Enteng at si Ako', and finished 2nd. 'Pagpag' trailer is also the 2nd most-viewed on Youtube, having half a million hits. The 4th top grosser would probably be 'Kimmy Dora: Ang Kiyemeng Prequel', starring Eugene Domingo and Sam Milby, while it might be a battle of action films for #5: Robin Padilla's '10,000 Hours' and the ER Ejercito-KC Concepcion movie 'Boy Golden: The Arturo Porcuna Story'. Gov. ER Ejercito aka Jorge Estregan Jr has been part of the past two MMFFs and his movies both landed in the Bottom 3. Don't be surprised if his latest movie ranks in the bottom again. In the Bottom 2 most probably are 'Pedro Calungsod, Batang Martir', with Rocco Nacino in the title role, and the movie inspired from the music of the late Francis Magalona, 'Kaleidoscope World', starring Sef Cadayona and Yassi Pressman. But I won't mind if 'Pedro Calungsod' gets a higher ranking (perhaps up to 6th only) since many sectors are endorsing this film. Good luck to all 8 entries! MMFF shouldn't really be a competition, but it should be a celebration of local films. Let's all support Pinoy movies!